When you think of Carnevale in Italy, Venice comes to mind with its lavish costumes, elaborate masks, and inability to find a reasonable hotel during these festivities. But if you happen to be in Rome instead, we invite you to stay in the Eternal City to experience Carnavale the Roman way. The two most popular piazzas where you’ll find Carnevale excitement during the 10 days of the festival are Piazza del Popolo and Piazza Navona, although you’re bound to find parades, street performances, plays, butteri (Italian cowboys), costumes, and face painting and more in many areas of Rome’s center. If you just show up, you’re bound to find something fun and exciting happening for adults and kids alike! If the idea that the Carnevale is just a pre-lent adult fun, think again! Carnevale is just as much fun for kids! If you are traveling with kids during this time, it’s a great opportunity to dig out their Holoween costumes for this special occasions. From Disney cartoon characters to princesses, knights and jesters, during Carnevale you are only limited by your wildest imagination. Sometimes even pets get in on the fun! On Fat Tuesday (Martedí Grasso) Piazza del Popolo hosted the grand finale of the Carnevale celebrations in 2012. If you have other plans during the day, leave your evening free because this event is one you don’t want to miss! 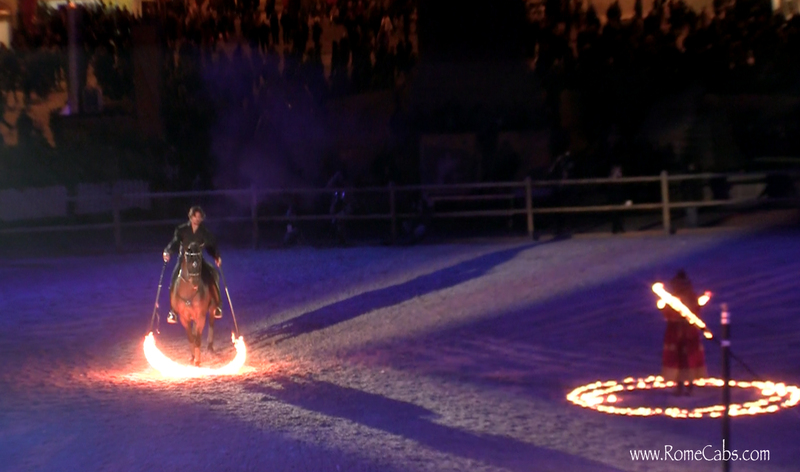 The dramatic and theatrical equestrian presentation on Tuesday, February 24, 2012 followed by a 15 minute spectacular display of fireworks from the Pincian Hill behind the piazza left the hundreds of spectators speechless. The photo gallery on the Rome Cabs flickr account features photographs taken from the late afternoon and evening performances in Piazza del Popolo on Marti Gras including the breathtaking 10 minute long fire works display from the Pincian Hill behind Piazza del Popolo. For more information on Rome Cabs, please visit our website at www.RomeCabs.com. We hope to hear from you and be of service to you on your next visit to Rome! Sharing is fun: if you found this article helpful and interesting, pass it along to others who might benefit from it. Thank you for stopping by and reading our blog. We look forward to seeing you soon in the Eternal City!